What’s in a name? Certainly, in this case, there is a lot! The region has three rivers creating magnificent valleys, two exceptional caves and, amongst its often rugged terrain, charming medieval villages and picturesque chateaux. The landscape is a captivating mix of limestone cliff, wooded slopes and pastureland, dotted with bastide towns and defence positions from olden days. Originally part of Quercy before France was divided into departments after the Revolution, the Lot more than hints at a prehistoric age. The Amédée Lemozi Regional Prehistory Museum at Pech-Merle, for instance, exhibits more than 350,000 years of life, tools, weapons and jewellery from pre-Neanderthal times up to the Iron Age. 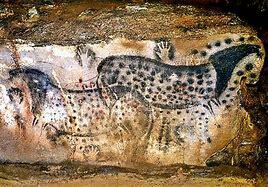 More pre-historic evidence emerges in the Pech-Merle caves with more than 70 animal pictures including the Spotted Horses, a fabulous display of cave art that is more than 29,000 years old. In fact, there are a dozen more painted caves within 10km of this famous attraction but, sadly, they are currently closed to the public. When the Romans invaded in 51 BC, the Gaulish tribe of the Cadourques was overrun and the Romans took over the region. They founded a City across a wide section of the river Lot, near a spring worshipped by the Gauls in honour of the goddess of water, Divona. 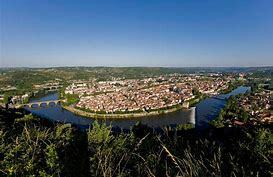 Today, that city is Cahors and the spring is known as the Fontaine des Chartreux at the Maison de l’Eau. The Lot has taken part in many a war with the Albigensian Crusade in the Middle Ages, the Hundred Years War from 1337, and the eight Wars of Religion from 1562 and 1598. Thankfully, the days of fighting are over but many people still want to make the Lot their own, relishing in all that it has to offer. Time changes many things and when France was further divided into regions and re-named in 2017, Lot became a department of Occitaine. Thanks to its abundance of orchards, the Lot produces more jam than any other area of Europe. Flocks of geese ensure a plentiful supply of foie gras and confit, whilst large vineyards produce the very dark red wine of the Cahors AOC (appellation d’origine contrôlée.) The three Lot Causses (valleys), known as the Causse de Martel, the Causse de Gramat and the Causse de Limogne, are ideal for sheep to graze and ensure a good quality supply of cheese and meat. Local foods include Rocamadour cheese, a soft goats cheese served either hot or cold, often with honey. The Lot is one of the major production regions for truffles which, once found by the trained pigs or dogs, are turned into oils or vinegars or sliced into omelettes and other foods. Saffron, one of the most expensive spices is also grown locally, as well as Quercy melon and walnuts. In this department, if you ask for a Pastis you will probably not receive a pernod type drink, instead it will more likely be the local speciality, a light pastry filled with rum soaked apples. Tourism is a growing industry with second home owners, holiday makers and foreigners making the Lot their home. Improved roads and motorways have meant that more towns are in easy reach and, as a result, more tourist venues and attractions have been created to meet the ever increasing demand for more information about this fascinating region. Causses is the prefecture of the Lot. One of its most famous landmarks is the Pont Valentré, a 14th century fortress bridge that spans the river Lot and which took 70 years to build. Boasting six Gothic arches with two towers either end to control gates and portcullises, as well as a central tower for observation, the sight of it alone was enough to deter Henri IV when he set out to conquer Cahors in 1580. In this case, looks certainly are everything as it has never actually been under attack. The Cloister at the Cathedrale Saint-Etienne features scenes of everyday life as well as a Madonna and is as flamboyant as the 15th century paintings that are now housed in the St Gaubert Chapel. 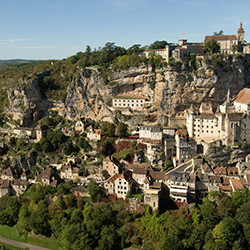 Set in the north of the Lot and presenting one of the most beautiful rock faces on earth, is Rocamadour, a sacred spot which also happens to be France’s second most visited place by pilgrims. Rising from the lower town which sits above the Alzou canyon, flights of steps ascend up the side of the cliff to a massive group of churches about half way up. Thankfully, for those less inclined to manage the incline, there is a lift and car park. 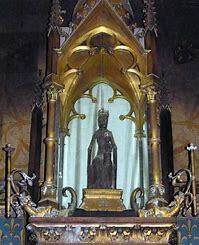 The pilgrim church of Notre Dame can be found here together with the wooden Our Lady of Rocamadour Black Madonna which is said to have been carved by Saint Amadour. In case the connection is not obvious the body of a hermit, who was thought to be Saint Amadour, was found in front of the Notre Dame in 1166. The town took his name, Amadour, which then became Rocamadour, the rock of Amadour. 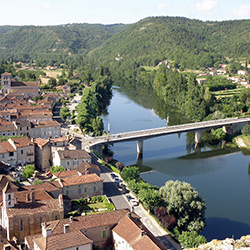 Situated on the banks of the Célé River and en route to Santiago de Compostela and Rocamadour, is Figeac. In 1302 when the local abbot, Philip the Fair, made Figeac a possession of the French Crown, he also gave the town the right to mint its own money. Unfortunately, that is no longer the case and the Hotel de la Monnaie (which never actually minted the money anyway) is now a restored 13th century Gothic building. Half-timbered buildings are the hallmark of Figeac with its 17th century carved and painted wooden panels at the Chapelle Notre Dame de la Pitié. Egyptian writing in the form of the Rosetta Stone may not necessarily come to mind when thinking of this part of France but, in fact, a young Jean Francois Champollion, who was born in Figeac in 1790, deciphered the Egyptian hieroglyphics. A huge replica of the Stone can be seen from above the Chapelle Notre Dame de la Pitié and, in honour of his achievement, the Musée Champollion was created in 1986, giving pride of place to the part that Jean Francois played in the history of writing. For a sense of life in a medieval village, stop by the Rignault Museum in the breathtaking village of Saint Cirq Lapopie. As well as the thirteen listed historic buildings, it is worth taking a walk up to the fort and the Chateau de Cénevières to take in the fabulous views along the Lot valley. Don’t miss the ancient “Chateaux des Anglais”, a series of fortifications built into the rock along the Lot and Celé valleys. This is only a tiny selection of the delights that Lot can offer. You will find a wide selection of other tourist spots, churches, hotels and events in our Business Directory and What’s On pages. Why not take a look, you can search under category type, town or region. 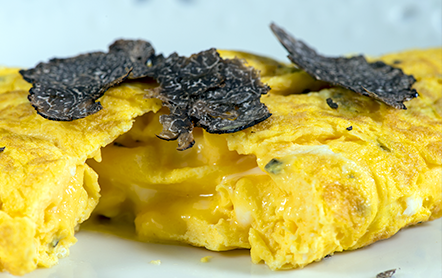 Did you know that the flavour of a truffle can actually permeate through an egg shell? So store your truffles with the eggs for a while before you make your omelettes! – Slowly fry an ounce of roughly chopped truffle in a large knob of butter, add 1tbs of sour cream and 1tbs port or cream sherry. Keep warm while you make the omelette. Meanwhile heat the grill to its highest setting. – Slowly heat a knob of butter in a small frying pan (keep the heat low to make sure it doesn’t burn). Whisk 6 eggs and, when the butter has melted, pour in half of the egg mixture and move the pan around to make sure the entire base is covered. – Once it is looking almost cooked, add half the truffle mix to the centre and place the pan as close to the grill element as possible. The eggs will rise and form a fluffy mound. Using a spatula, loosen the edges and fold over. Tip out of the pan onto a plate and enjoy. – Repeat to make the second omelette or, if you prefer make one large one and divide into two.